Welcome to the gnuplotxyz wiki! This software interface was largely developed by Uwe Schneider . Credit goes also to Bruce McCarl who initiated the project and did some initial programming and to Thomas Rutherford. Tom's existing gnuplot interface provided useful guidance. Additional contributions were made by Michael Bussieck and Armin Pruessner from GAMS Development Corporation. Thanks also to Hans-Bernhard Broeker from the Gnuplot team. There is (almost) no technical support. Bug reports/fixes are welcome. Gnuplotxyz.gms allows users to plot data from GAMS runs in GNUPLOT. Gnuplotxyz.gms is user friendly as only one single line is needed to produce a plot. Nevertheless, many of the default options can be changed by using optional statements as illustrated below. In addition, one can modify the gnuplotxyz.gms file for personal needs and preferences. Copy the file gnuplotxyz.gms to the .\inclib subdirectory of your GAMS system directory. The data to be graphed as 2D-plot must be contained in a three-dimensional parameter, i.e. a parameter which has three indexes. The elements in the first argument determine different lines in a plot. The elements in the second argument determine the points of each line. The order of elements in the second index determines how the different data points pertaining to one line are connected. The remaining argument (third index) must contain at least two elements of which one depicts the x-axis and another one the y-axis. If you choose styles with error bars you may need to give additional values (see examples). Applies automatically to parameters with 3 indexes and one argument after $libinclude gnuplotxyz. If each index contains rather many elements than the plot will not look nice. The statements in square brackets above are optional. If used, the title of the graph will show the current element of the loop. You can "unset" the values of these variables by assigning "no" or "0" (see below). The data to be graphed as 3D-plot must be contained in a four-dimensional parameter, i.e. a parameter with four indexes. The elements in the first argument determine the different planes in a plot. The elements in the second argument determine the number of x-axis values. The number of elements in the third argument determines the number of y-axis values. The order of the elements in the second and third index determines how the different data points pertaining to one plane are connected. The remaining argument (fourth index) must contain at least three set elements of which one represents the x-axis, another one the y-axis coordinate, and a third one the z-axis coordinate. Through use of global variables, the format of the plot can be changed. If it doesn't work at all or not as you intended, you can examine gnuplotxyz.gms to find out how it is used and to fix the problem. Modifications of gnuplotxyz.gms may be necessary a) to implement additional plotting features and b) to fix bugs. The best way to fix a problem is to work backwards. 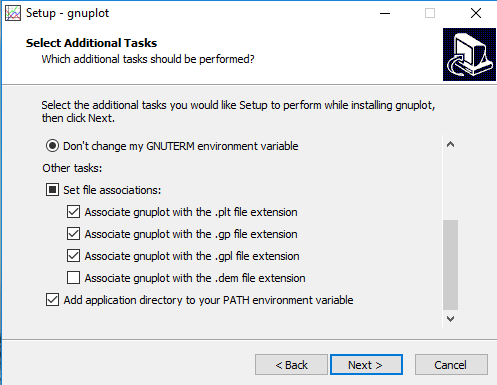 Step3: Modify "gnuplot.inp" and/or "gnuplot.dat" and test by running "test.gms"
Step4: If you found out how "gnuplot.inp" and/or "gnuplot.dat" should be changed, modify statements in "gnuplotxyz.gms" to produce the desired content in "gnuplot.inp" and/or "gnuplot.dat"